Our return to La Marée was a last minute plan change; we were set on steaks at Beef Bar until one of our diners, Shiraz Mamedov, sent a message about some health research he was doing. Publisher John Ortega followed up with some Internet pages and by the afternoon had decided that we had to find something healthier than beef. 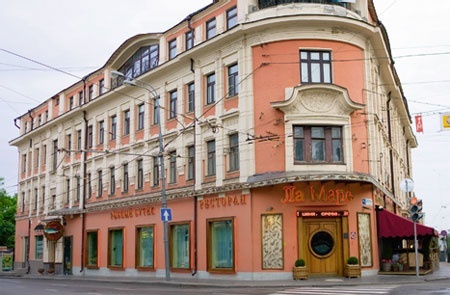 La Marée is one of Moscow’s best restaurants and it certainly has the best seafood in the city, as it should be since Tunisian owner Mehdi Douss is the Big Onion’s premium seafood importer and distributor. He flies seafood to Moscow from the corners of the globe several times a week. 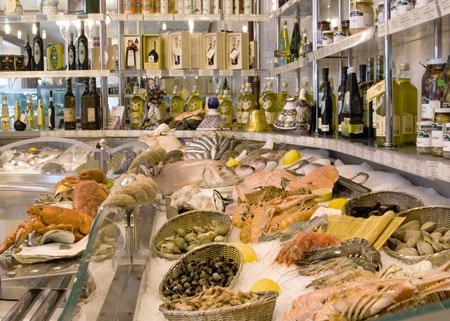 The entire selection is laid out on ice in the adjacent seafood boutique, usually a La Marée diner’s first stop for a peek at the catch of the day. Live Kamchatka crab and blue Breton lobsters glare out from fish tanks and there are about a dozen varieties at the oyster bar including huge Kurile oysters (660r each). 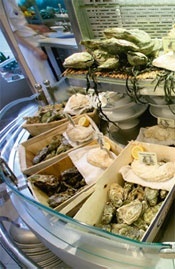 Our oysters ranged from about 200 to 350 rubles each. Chef Abdessattar Zitouni’s menu is extensive, drawing on scores of seafood selections prepared whole, filleted, baked in salt, steamed, “la plancha” or with Tunisian spices. Zitouni is a master of the Tunisian kitchen presenting such dishes as Tunisian Fish Chowder (750r), but he has also conquered other cuisines with such creative plates as Crispy Cheburek with Tuna, Capers and Soft Egg (480r), Soft Shell Crab and Vegetable Tempura with Ginger Sauce (1320r), or Fennel Crusted Giant Scallop with Artichoke (1050r). Chef Zitouni joined us in the seafood boutique where we decided to bypass the menu; John ordered Bouillabaisse for the table and he and Shiraz selected fish and seafood for a La Plancha dinner: baraboulka, sculpin, sardines, calmari, scallops and a couple of varieties of shrimp. A chef’s complement was first out, a cube of fresh tuna with finely chopped fresh sweet pepper, accompanied by a basket of very fresh home-baked breads and rolls and some very thin sliced dark bread. The Bouillabaisse was dished out at the table after the servers hung starched white bibs around our necks. This Marseille specialty fish stew consisted of a dozen varieties of fish and shellfish, large pieces or even whole swimming in a thick textured, dark amber broth – so good you could almost feel the Provencal coast. The “la plancha” seafood came out on a huge platter, grilled without adornment, just the way to enjoy La Marée’s fresh catch. 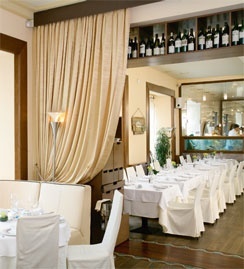 La Marée has a very good wine list, naturally heavy on white wines. We started with a Bonny Doon Albarino Ca’ del Solo 2007 (3200r), a California Central Coast biodynamic production from a white grape from northwestern Spain (3200r). We then tried a Condrieu Andre Perret 2007 (6100r). La Marée left a better impression on me than our last visit; it appears to have matured. Its impeccable and polite service makes its operation appears tight, and, as I understand, a reflection of Mr. Douss’ pride in his establishment, the sign of a consummate restaurateur.